Turn to our local company and get quality dryer repair in Lodi, New Jersey. You won’t find a team of pros more devoted to customer care. Our techs are experienced with fixing and installing many different types of dryers and washers. We will service all home appliance makes and models. Our experts are trained to work on all the major brands. A dryer is a popular appliance in many homes. Many people don’t have the room or the time to dry clothing outside. 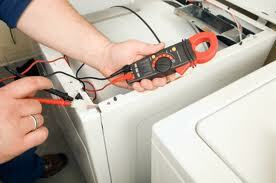 If your dryer breaks down, call Appliance Repair Lodi NJ to get fast service at a reasonable rate. We excel at washer and dryer repair service. There are many different makes and models on the market today. These units normally work right, but sometimes something goes wrong. You may find that your washer is leaking water all over the floor. You might put clothes in the dryer and they never get dry. If this happens to you, do not panic. Take out your phone and give us a shout. One of our trained pros will respond urgently to provide the washer or dryer service you need. Our main focus today is on the residential dryer. We offer outstanding dryer installation service. You can choose our company to install any type or brand. We enjoy helping our customers in any way we can. Most of our service calls revolve around dryer repair. Heating elements tend to burn out, vents get clogged, and switches go bad. Our techs carry plenty of parts to fix these problems in a hurry. We hope your dryer never breaks down, but if it does; place a call to Lodi Appliance Repair. We will provide same day repair service at a price you will be happy with. Make us your first and only choice for Lodi dryer repair service.